The gravy I made for this dish was not a thundering success. I figured that whizzing up the golden onions, apple slices & carrots with Dijon mustard and a splash of cream was an inspired idea for a low-carb gravy, but I was mistaken. The flavours were great, but it had a curious grainy texture, with none of the silken mouth-feel I expect from a good gravy. My family weren't at all keen, and did not hesitate to tell me so. The pork and onions were scrumptious, however, so please try this recipe, and disregard the bowl of gravy at the top left of the picture below. (I have given instructions for preparing the so-so gravy at the end of the recipe, in case you low-carbers feel like giving it a go.) This recipe is suitable for diabetics, and for anyone on a low-carb #LCHF regime. Wine recommendation from Michael Oliver: Zonnebloem Limited Edition Pinotage 2010. Go to the end of the page for more detail about this pairing. 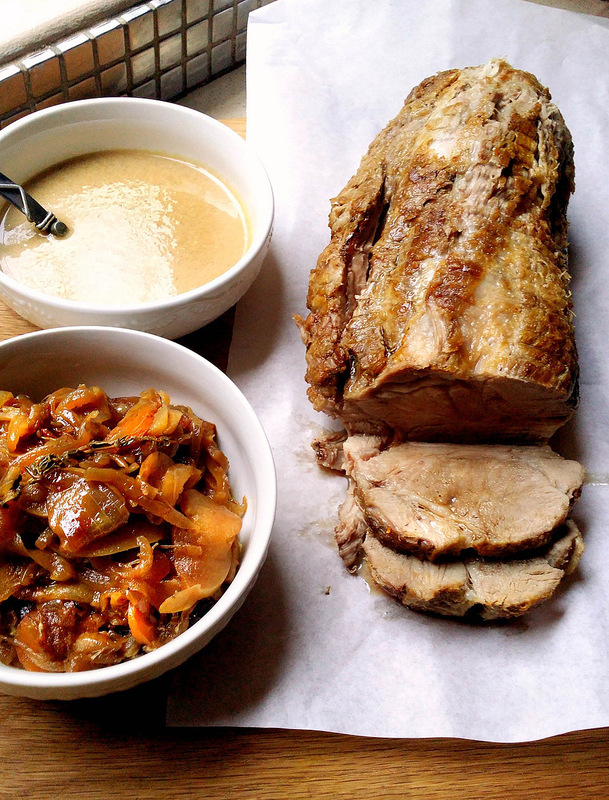 My 2009 recipe for Roast Pork Neck with Leeks, Carrots and Apples has been the second-most popular recipe on this blog for many years (the first being South African Ginger Beer). Pork neck is an inexpensive cut ideal for slow roasting. It has superlative flavour and a melting, juicy texture that cannot be rivalled by any other cut of pork. It's a little difficult to find, but I'm pleased to see that Food Lovers Market now stocks vacuum-packed pork necks. If you don't have a branch near you, look for it in a good German butchery, or ask your own butcher to order it for you. onions, bay leaves, thyme sprigs, fennel seeds and an apple. The fennel seeds add a very faint aniseed flavour, but you can leave them out if you wish. If you're on a very low-carb regime, you might elect to omit the single apple in this recipe, but I urge you to leave it in, because it adds a lovely sweet note. It's a pain in the neck to slice onions, so I do this in a jiffy using my food processor and its thickest slicing blade. Serve this with bright steamed vegetables, or with tender-stem broccoli, griddled courgettes, or shredded stir-fried cabbage. When the oil is beginning to shimmer, add the pork neck. Sear it over a high heat on all sides, until it is golden-brown all over. You may find that the meat sticks to the bottom of the pan for the first few minutes, but it will loosen with a gentle nudge once its surface has browned. This process should not take more than about 6-7 minutes, if your pan is hot enough. Remove the meat from the pan and set aside on a plate. Add the onions, carrots, celery, apple, bay leaves and thyme sprigs. Cook over a low heat, uncovered, stirring now and then, for 15-20 minutes, or until the onions are soft and a glorious golden colour. Don't allow the onions to burn, or you risk a bitter flavour. Now add the garlic and cook for another minute, without letting it brown. Turn up the heat and add the wine and vinegar. Deglaze the pan by stirring and scraping briskly to dislodge any sticky bits. and roast at a low temperature for two hours. Pour in the water and place the pork neck on top of the veggies, along with any juices that have collected beneath it. Cover the pan (use a double layer of tin foil if you don't have a lid that fits snugly) and bake for one hour at 160 °C. Remove the lid or foil, and add a few more tablespoons of water if the onions seem dry. 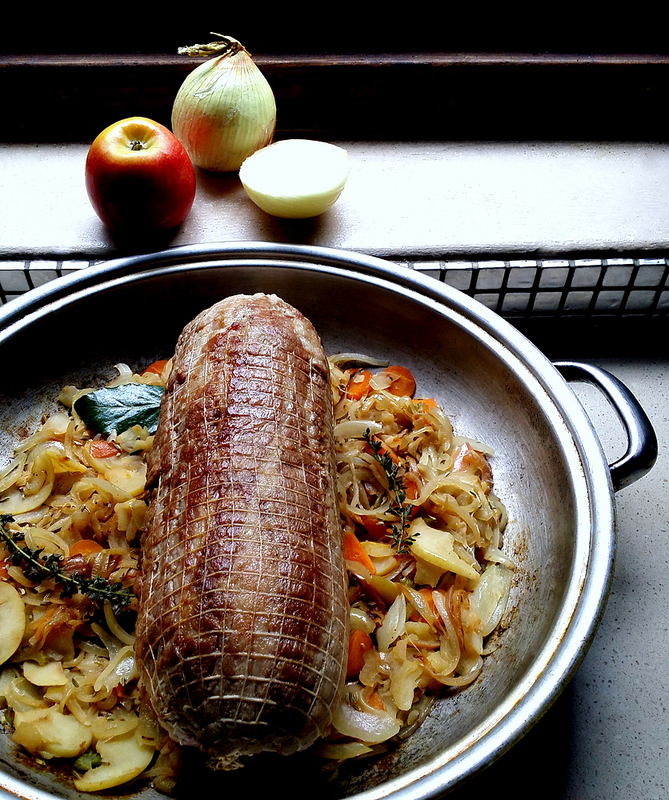 Turn the heat down to 150 °C and roast for another hour, uncovered. Remove the pork neck from the pan, place it on a warmed platter and let it rest, loosely covered with a sheet of tin foil, for 15-20 minutes. When you're ready to serve, gently reheat the vegetables on your stove top and stir in the mustard. Season to taste with salt and black pepper. Snip through and gently tear away the netting on the pork neck, then carve it into thick slices. Arrange these on a warmed platter, pour over any juices that have accumulated under it, and serve hot with the caramelised veggies. If you'd like to try my-not-very successful low-carb 'gravy', remove two-thirds of the onion mixture, set aside and keep warm. Heat the pan containing the remaining veggies, add two-thirds of a cup of water and bring to a gentle boil. Use a stick blender to blitz the mixture as finely as you can, adding more water if necessary. Stir in 3 Tbsp (45 ml) cream and a little more Dijon mustard, if you think it needs it. Season generously with black pepper and serve hot. It looks like: Deep ruby at the core, which pales to ruby garnet around the edges of the glass. It smells like: Red and black berry fruits, whispers of charcuterie and smoke from the barrels. It tastes like: Classical red Pinotage berry fruits, ripe bloodplums, a smidge of savouriness and smoke. Elegant with ripe tannins, fruit, acidity and the oak all perfectly balanced.